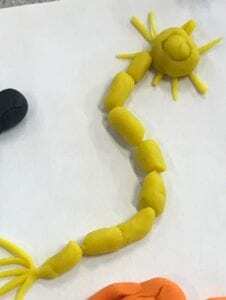 The function of a neuron is to process and transfer information. A neuron is composed of many structures to allow it to carry out these functions daily. 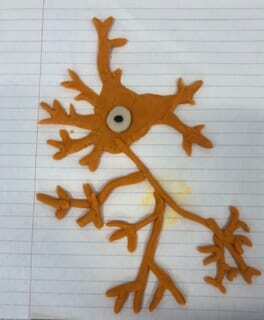 The neuron consists of dendrites, a cell body, axon, myelin sheath, and terminal buttons. The functions of these structures is explained in the diagram below. There are three types of neurons; the motor neuron, sensory neuron, and the interneuron. 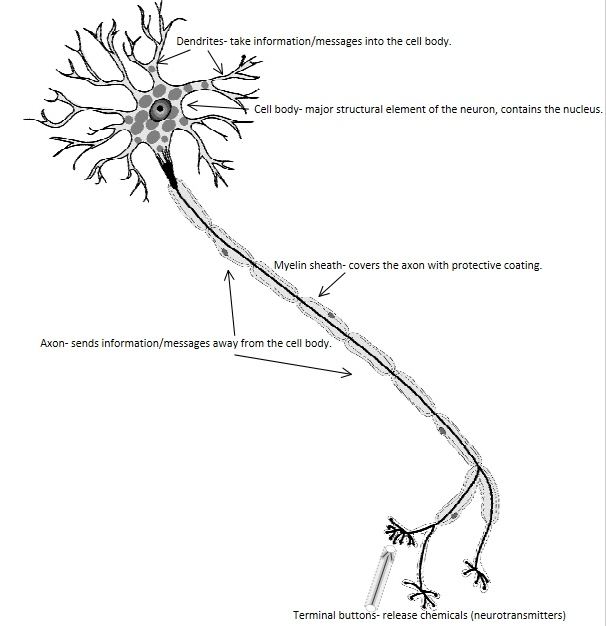 Motor neurons are part of the central nervous system and connect to the muscles, glands, and organs in the body. Sensory neurons are activated by sensory input from the environment and send information to the brain when stimulated. Interneurons consist of the neurons that connect sensory neurons to motor neurons and vice versa, assisting in the transfer of information. 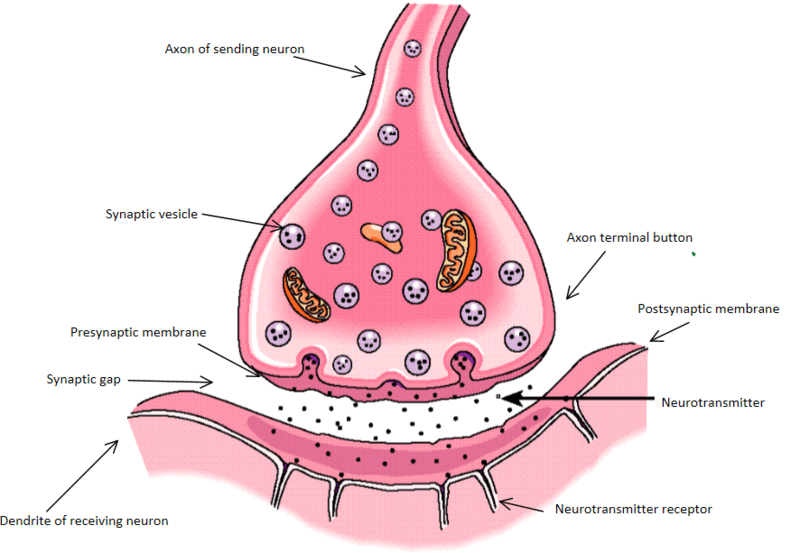 Action potential occurs when a neuron is stimulated. 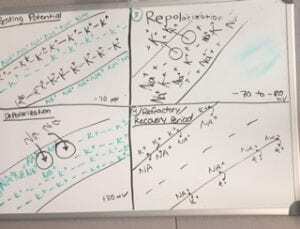 Prior to an action potential, a neuron is in resting potential where the axon is in a polarized state with a charge of -70 millivolts relative to the outside of the axon. During resting potential, the fluid inside the axon has more negatively charged ions than the fluid outside. Next, depolarization occurs when channels open in the membrane of the axon to allow sodium ions to enter, creating a balance of ions. Therefore, depolarizing the inside of the axon. This has a charge of about +30 millivolts. 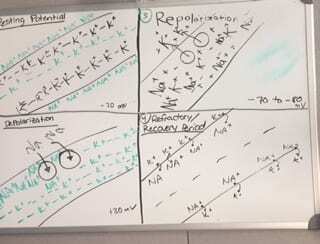 More channels then open to allow potassium ions to exit, repolarizing the axon (-70 to -80 millivolts). The recovery period involves the action potential continuing along the entire length of the axon from the cell body to the terminal buttons. 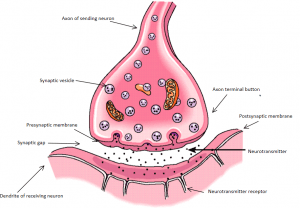 The synapse is a gap between the axon of one neuron (sending neuron) and the dendrite of another (receiving neuron). 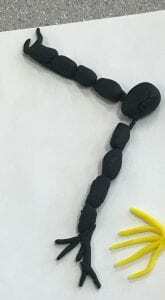 The terminal button of a neuron wants to release chemical messengers (neurotransmitters) from the axon to pass on information to another neuron. This is how neurons “communicate” with one another and can be visually demonstrated by the diagram below.